Are Turkey, Germany and the Netherlands crying wolf on human rights? There’s a legal route for countries that take human rights seriously, writes Başak Çalı. Başak Çalı is professor of international law at the Hertie School of Governance. March saw unusually tense diplomatic relations involving Turkey, Germany and the Netherlands. In an almost theatrical display of protocol, ambassadors from all sides were ushered through a revolving door of summons and the serving of oral warnings and notes verbales. A Turkish minister was declared persona non-grata. The flag on the Dutch consulate in Istanbul was forcefully exchanged for a Turkish one. The Dutch ambassador was asked not to come back to Ankara. The atmosphere is calmer now and no one expects an end to diplomatic relations, but the question remains – what was all the fuss really about? What made this diplomatic spectacle distinct was the repeated reference to ‘concern for human rights’. The Germans expressed their concern about events in Turkey. The Turks expressed theirs – first about Germany and then about the Netherlands. Has inter-state diplomacy really become a servant of human rights? Or is this yet another episode of states just talking a good game? Unfortunately, it seems the latter is the case. Human rights and bilateral diplomacy do not mix well. Such posturing turns human rights into cheap talk or, worse still, leads to the repartee: ‘What about human rights in your country?’ One goal of legalising human rights over the past seventy years was to prevent precisely this. If states are genuinely serious about their human rights concerns in other countries, they should abandon empty talk and instead turn to third party adjudication. For European states, bringing inter-state cases before the European Court of Human Rights is the way to do this. The diplomatic standoff in Germany started when a Turkish judge ordered the pre-trial detention of Deniz Yücel, a dual-national Turkish-German journalist. Yücel was accused of disseminating terrorist propaganda and inciting public hatred. He had reported on the publicly available, but leaked emails of Turkey’s minister for energy (who is also President Recip Tayyip Erdoğan’s son-in-law). German Chancellor Angela Merkel said she would do everything in her power to secure Yücel’s release, but he remains in detention and Germany has not been given consular access. Yücel is one of many journalists in pre-trial detention in Turkey, amid a decaying human rights climate. The European Commissioner for Human Rights and the Venice Commission, the Council of Europe’s independent legal expert group, have repeatedly raised concerns about this situation. Against this backdrop, the town of Gaggenau in south-western Germany withdrew permission for an event at which the Turkish justice minister was to rally for a ‘yes’ vote in Turkey’s upcoming constitutional referendum. Gaggenau claimed the event space was too small. The minister decried this as “unacceptable” and cancelled a meeting with his German counterpart. Ankara then summoned Berlin’s ambassador, issuing him with a verbal and written note – signalling a strong diplomatic protest. A few days later, Erdoğan sharply criticised Germany for its failure to respect fundamental human rights, and compared Berlin’s actions to Nazism. Then came the Netherlands. The Dutch did not want Turkish political rallies on their soil before their elections on 16 March. After Turkey’s minister of foreign affairs said rallies would take place anyway, his plane was not allowed to land in the Netherlands. The Turkish family minister was then declared persona non-grata, after trying to drive to the Netherlands from Germany for a rally, an act the Dutch said defied their sovereignty. 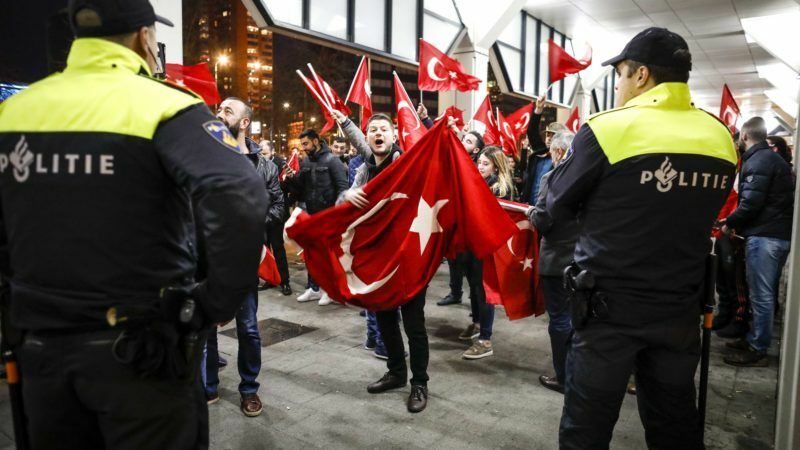 The Dutch police subsequently shut down a protest in Rotterdam supporting the Turkish government, with claims of double standards and more accusations of Nazism and fascism by Turkish politicians. This diplomatic stand-off took place at the heart of Europe, home to the European Court of Human Rights. All three parties to this crisis are members of the Council of Europe and are under the compulsory jurisdiction of this court. Under the European Convention on Human Rights, any of them could bring cases concerning human rights violations committed in each other’s territories. Indeed, states do not need to be directly affected to bring them. This has been done on numerous occasions: Denmark, Norway, Sweden and the Netherlands filed an application against Greece during its military junta in the 1960s. The Republic of Ireland brought two cases against the United Kingdom in the 1970s. Denmark brought a case against Turkey concerning torture practices in the late 1990s. More recently, Georgia and Ukraine brought cases against the Russian Federation. If the concern for human rights violations by Turkey, Germany and the Netherlands were genuine, this would be the best path to make progress in improving human rights protections. Germany’s inter-state case could focus on the arbitrary detention of Deniz Yücel, but it would not have to be limited to this. Under the rules of procedure, Germany can bring a case against Turkey on any aspect of the rights enshrined in the Convention. So the case may focus on freedom of expression in Turkey more broadly or the freedom of expression of journalists more precisely. It may also cover other related concerns such as arbitrary detentions and the right to a fair trial. The Netherlands could join Germany in bringing this case. Turkey could consider bringing an inter-state case against Germany concerning limitations on the freedom of assembly. With respect to the Netherlands, Turkey could also focus on freedom of assembly and the treatment of individuals by the police in subsequent protests. In these cases, Turkey could ask the Court to decide on whether discrimination against Turks played any role in the alleged rights violations. No party seems to be preparing such action. Human rights: winners or losers? One thing is clear: the stand-off has done nothing to improve human rights protections. Human rights were simply rhetorical tools used solely to score points with international and domestic political audiences. If any Council of Europe member state is truly concerned about human rights in other countries and is to be taken seriously, merely voicing concerns, protesting or engaging in petty point-scoring will not achieve this. There is one path alone. Bringing inter-state cases before the European Court of Human Rights will fend off criticism that states are acting as the judge and the jury in such spectacles. Asking the European Court of Human Rights to assess human rights violations and what is to be done about them – and respecting its judgment in good faith – ­would be a win-win situation for human rights protections in all three countries and across our continent.